How a piston pump can extend service life and reduce costs. If lubricants are a part of your services, you could be leaving money on the table, or more specifically, in the container. Manufacturers and operators use a wide range of specialized, high-tech lubricants that improve performance and extend the service life of equipment in extreme temperatures, harsh environments, heavy-duty service and other adverse operating conditions. These lubricants are available in a number of formulations for manufacturing, mining, construction and vehicle service applications. Specialized lubricants cost hundreds of dollars or more for a single container. Due to airborne dust, grit or other contaminants in facilities, excess lubricant that escapes from its original container and is exposed becomes contaminated and cannot be collected and recycled for use in a new container. To reduce costs associated with wasted product, it is critical that lubricant application systems use all of the lubricant in each container and avoid operating practices that result in waste during the application process. That is where piston pumps can help. 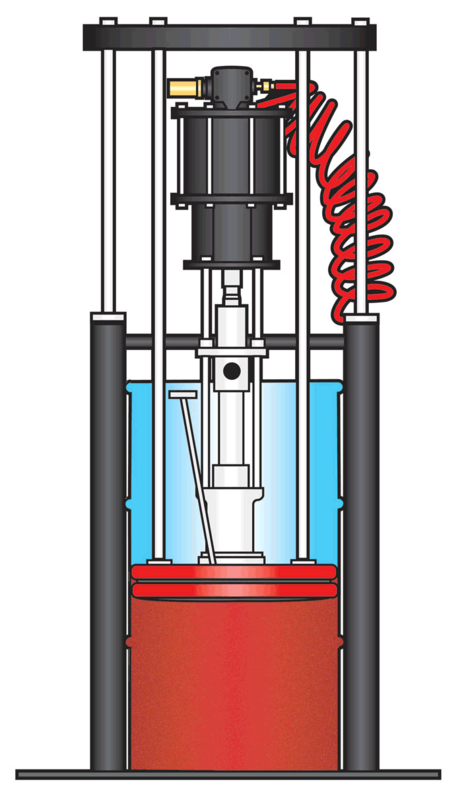 A piston pump is a reciprocating positive displacement pump that uses a piston or plunger to draw and move fluid through a sealed cylinder. Piston pumps can handle a range of fluids, making their versatility ideal in lubricant applications. The type of lubricant and its viscosity determines whether two-ball, four-ball or chop-check reciprocating piston pumps are best for the lubrication application system. Higher viscosity greases generally require chop-check pumps with follower plates, powered pneumatically or by gravity. With these thicker materials, select a ram system and follower plate powerful enough to move the specified lubricant at the desired rate. The main goal when configuring piston pump systems for lubrication applications is to retain as much lubricant as possible. For an expensive lubricant product, even a small amount remaining in a container can result in thousands of dollars in wasted product when multiplied over hundreds of containers a year. In a piston pump system, the two main areas where lubricant loss can occur during operation are along the follower plate seal and at the bottom of the material container. Lubricant can escape between the follower plate seal and inner container surface during operation, resulting in excess along the sides of the container or flowing over and accumulating on the top of the follower plate as it is pushed down by the ram. To prevent lubricant loss along the seal of the follower plate, select a follower plate and seal sized and configured to match the exact dimensions of the lubricant container. Steel and aluminum follower plates are available for U.S. and European standard containers and they also can be customized. Polyethylene, nitrile rubber or other materials can comprise follower plate seals, depending on the viscosity and formulation of the lubricant. When using these lubricants, manufacturers can add backers to follower plate seals and attach them to standard follower plates to stiffen the seal and improve the sealing action between the follower seal and the container. Excess lubricant can also be left at the bottom of the container at the end of an application cycle, preventing all of the material in the container from being used. To eliminate that waste, a flat-bottomed follower plate can ensure that all the material available in the container enters the piston pump. Another important consideration when configuring pumps for use in lubrication applications is identifying a piston pump that can operate at the correct speed to maximize service life and keep service costs to a minimum. Using a smaller piston pump that has to operate at a higher cycle rate to generate adequate flow may require more frequent service, resulting in higher ongoing maintenance costs. And a piston pump that must continuously run at its maximum cycle rate to provide the fluid transfer rate will ultimately have a shorter operating life. Higher cycle rates can also create problems with some shear-sensitive lubricants containing detergents or other additives by causing the lubricant to foam during application. To combat these issues, oversize the piston pump to prevent excessive cycle rate operation for your application. The key to extending operating life and keeping costs low for piston pumps is to select a pump that is capable of meeting the system’s fluid delivery requirements below its maximum speed in cycles per minute. That means if a transfer rate of 5 gallons per minute (gpm) is required for the application, specifying a piston pump with a 10 gpm transfer rate will allow the pump to run below its maximum cycle rate, ensuring maximum service life. In general for lubrication applications, a guideline is to specify a piston pump that can deliver the required flow rate and volume while operating at around 30 cycles per minute. This results in a good overall combination of low ongoing service costs, longer service intervals and longer pump operating lifetime. Although lubricants can be costly, the investment can be protected with the implementation of the piston pump practices to give lubricant waste a run for its money. Jim Artmann is the global product leader for piston pumps at ARO. For more information, visit www.arozone.com.